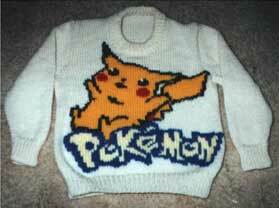 Pokemon chart knit on a jumper by Jen. Picture used with permission. For the small chart knit the yellow shape and duplicate stitch the other colours. Finally, outline as shown using a neat stem stitch and black yarn. 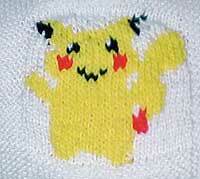 This image shows the small Pikachu motif knitted, before the outline is embroidered. Chart copyright © 1999 Sarah Bradberry. Jumper picture copyright Jen, used with permission. Scarf picture copyright Melody.